Help the cute unicorn Una to collect all gems! Your task in this addicting bubble shooter is to match at least 3 bubbles of the same color to remove them from the field. 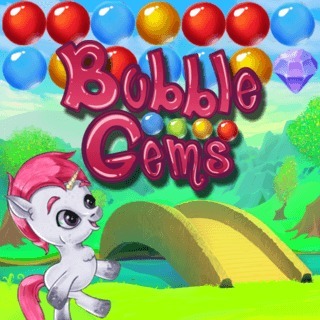 Destroy all bubbles, collect gems and try to earn as many points as possible. Bigger combinations will give you bonus points. Watch out and don't let the bubbles touch the red line, then the game is over! Can you reach a high score? Welcome to our famobilicious HTML 5 cross-device game catalog. Here you can find more than 300 non-exclusive and exclusive licensed HTML5 games, reviewed, categorized and hand-picked for every taste. Feel free to browse through our games created by developers from all around the world. If you like Bubble Gems games, you should check out the other games from our famobilicious game catalog. Do you need help? Why don't you check out our Help & Support category and see if your questions and problems can be solved.